I love it when one of my favourite authors releases a new book (and, you know, I only post GOOD book reviews on here. If I don't like a book, I don't review it). 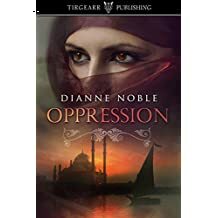 I’ve read all of Dianne Noble’s books: the first two were set in India. Her third, “Oppression”, is divided between the peaceful landscape of Yorkshire and the frenzy of Cairo, Egypt. There are apparently constant contrasts within the story, but as I read, I realised that maybe there are many similarities too. Beth is mentally abused, and probably soon to be physically abused by her controlling husband. Her miserable life, although affluent and, as seen from the outside, very comfortable, continues because she feels she’s not strong enough to do anything about it. Until the day she rescues Egyptian Muslim girl, Layla, from the brutal hands of her two brothers. Layla has, to save family face, been promised in marriage to an Egyptian man many years her senior. When Layla disappears, Beth finds she’s been sent to Egypt which spurs mild Beth into uncharacteristic action. She finds courage from somewhere and makes her way, on her own, to the underbelly of Cairo where wife-beating is the norm. Reading about life for the poor of Cairo was greatly interesting: the dirt, poverty (cockroaches that scuttle about in the night), the lack of water for showering, the way the men ogle blonde Beth. Fantatics. Yet fanatical is also Beth’s mother – an unforgiving (and completely non-Christian to my way of thinking) Methodist who spurns her own family because of her twisted views. “Oppression”, I think, is a profound story – oppression on so many levels proving the West has certain similarities with the Middle East. Ms Noble writes a powerful story with her incredible knack of creating settings so real that the reader is transported to the backstreets of Cairo and the rolling hills of Yorkshire. The story kept me up reading all night. Top marks!